Unknown, The Chimaera of Arezzo, about 400-375 B.C. Bronze. Object: H: 78.5 X L: 129 cm. VEX.2009.2.1 Museo Archeologico Nazionale, Florence, Italy. LOS ANGELES, CA.- Inaugurating the J. Paul Getty Museum’s partnership with the Museo Archeologico Nazionale in Florence, The Chimaera of Arezzo, on view from July 16, 2009–February 8, 2010, at the Getty Museum at the Getty Villa, features a masterpiece of Etruscan bronzework known as the Chimaera of Arezzo. This large-scale sculpture of a triple-headed, fire-breathing monster is comprised of three incongruous animal forms: a lion, a goat, and a serpent. Interweaving archaeology, mythology, religion, and conservation, the exhibition narrates the life and afterlife of this Etruscan icon. 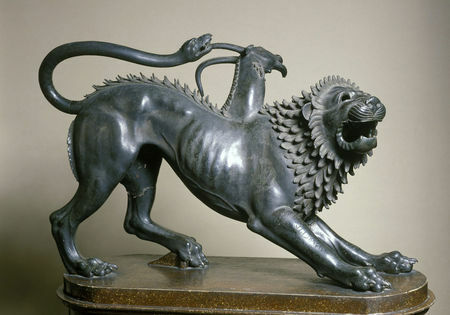 “Impressive in scale and dynamic in conception, the Chimaera of Arezzo is a tour de force of Etruscan bronze sculpture. We are delighted that our partnership with the Museo Archeologico is bringing to Los Angeles for the first time one of the most important objects of Etruscan art in the world,” said Michael Brand, director of the J. Paul Getty Museum. The Chimaera of Arezzo explores the myth of the Greek hero Bellerophon and the Chimaera over five centuries of classical art. Ancient artists embraced this compelling tale of triumph over adversity. Illustrations of the myth first appeared in Greek art in the early moreseventh century B.C., soon after the legend gained currency in the epic poetry of Homer and Hesiod. Commanded by King Iobates to kill the Chimaera, which was ravaging the countryside, Bellerophon rode into battle on his winged horse, Pegasus. Hurling a spear from above, the virtuous young noble slew the formidable beast, winning Iobates’ kingdom of Lycia (in present-day Turkey) and the hand of his daughter, Philonoë. 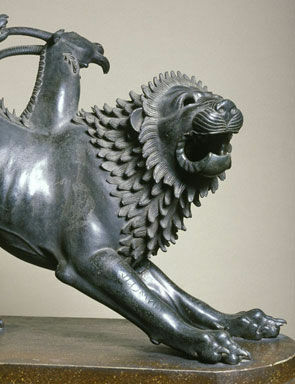 Few ancient works of art have a modern history as long and well-documented as the Chimaera. Dated to around 400 B.C., the Chimaera of Arezzo is the only surviving large-scale representation of this composite creature. Hollow cast in bronze, the figure is an outstanding example of the Etruscans' renowned skill in metalwork. Glaring up at an unseen adversary, the monster's defensive posture suggests that it was originally part of a larger composition that once included the figures of Bellerophon mounted on Pegasus. On November 15, 1553, the statue was discovered in a cache of votive offerings outside the San Lorentino gate in Arezzo. No trace of the equestrian group, however, was found. Immediately transported to Florence, the Chimaera and several smaller bronze statuettes deposited with it were installed in the Palazzo Vecchio, the residence of Cosimo I de’ Medici. Cosimo’s lead architect, Giorgio Vasari (1511–1574), was the first to publish the extraordinary bronze as the Chimaera of the Bellerophon myth. Court scholars were fascinated by the Etruscan inscription on its right foreleg, which identifies the statue as an opulent religious offering to the supreme Etruscan god Tinia (equivalent to the Greek Zeus and the Roman Jupiter). Vasari designed Cosimo’s study as a private museum, called the Scrittoio della Calliope, which held the figurines found in Arezzo as well as later Tuscan works. 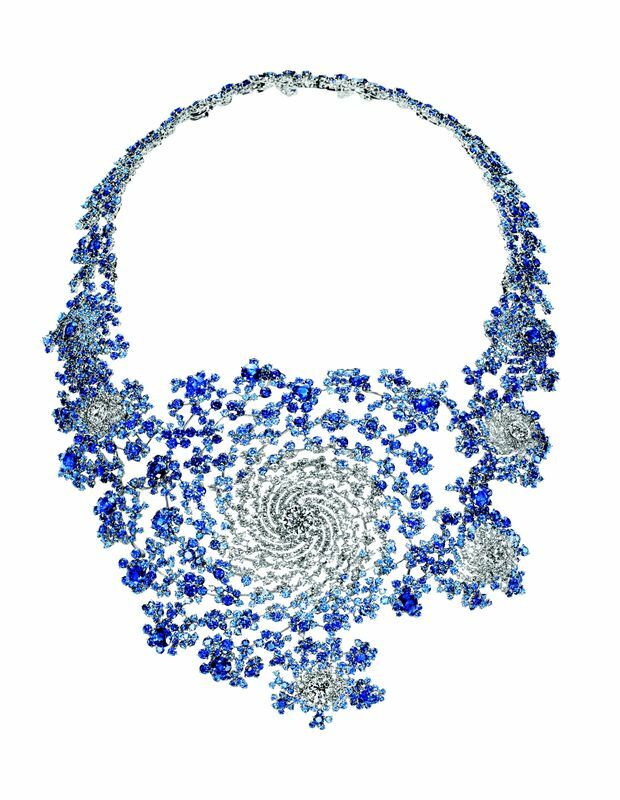 He commissioned the celebrated goldsmith Benvenuto Cellini (1500–1571) to assist in restoring them. Around 1558 the Chimaera was mounted in the grandly frescoed apartments of the Medici pope Leo X, where it was admired by distinguished visitors, artists, and writers. An emblem of Florentine political power and cultural heritage on a par with Rome's famed Capitoline She-Wolf, the figure was hailed by Cosimo as a symbol of his dominion “over all the chimaeras,” a reference to his conquered foes. The sculpture remained in the Palazzo Vecchio until 1718, when it was transferred to the Uffizi Palace. “From its origins in Greek literature, to its realization by an Etruscan sculptor steeped in the artistic ambiance of southern Italy, the myth of the Chimaera has endured as an allegory—of culture versus nature, spirit over matter, and right over might,” explains Claire Lyons, the Getty Museum’s Curator of Antiquities, who curated the exhibition with assistance from Seth Pevnick. This extraordinary bronze will be displayed alongside antiquities from the Getty Museum’s collection, together with loans from museums in Rome, Naples, Basel, New York, Boston, and Atlanta, which situate the sculpture in its ancient Italian context. In addition to its Etruscan masterpiece, the Museo Archeologico has generously lent ancient coins from the Medici collection that depict the Chimaera as well as bronze statuettes of a youth, a bearded man, and mythical monsters, some of which came from the same votive context as the Chimaera. Illuminated manuscripts from the Getty Museum and historical engravings and books from the Getty Research Institute illustrate the legacy of the Chimaera myth in Medieval Christian imagery and its reception during the Renaissance. Among the highlights from the Getty Research Institute’s own collection collections is a 1582 sketch of the Etruscan inscription on the Chimaera’s foreleg, made by the noted classical scholar Alfonso Chacón. 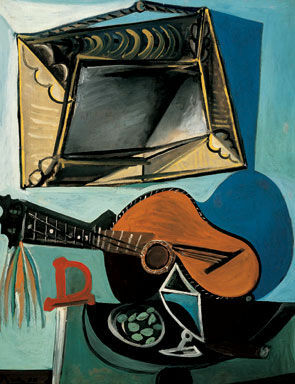 "Chacón's illustration—the earliest graphic record of the sculpture—was discovered in the Library of the Getty Research Institute," adds Lyons. "It demonstrates the burgeoning interest of Renaissance historians in ancient Etruria."